Best wishes and messages of support are pouring in for Régis Labeaume. His office said he is making his diagnosis public in the spirit of transparency and to raise awareness about screening for men. 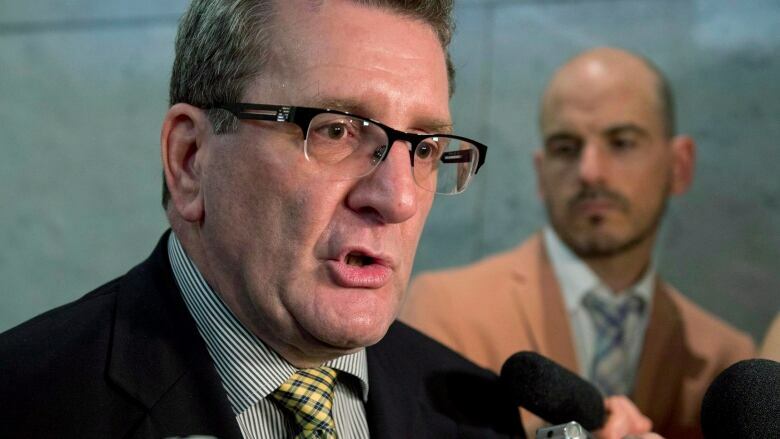 Quebec City Mayor Régis Labeaume has prostate cancer, his office announced today. A statement from the mayor's office said Labeaume is making his diagnosis public in the spirit of transparency and to raise awareness about screening for men. Labeaume will stay in his position for now, but the statement said he will gradually reduce his workload and intends to eventually step down for an undetermined period. Quebec politicians showed their support for the mayor after his diagnosis was announced. Premier François Legault said he knows Labeaume is a "fighter" and said he looks forward to seeing him come out of this even stronger. "We look forward to seeing you in fine form," he said. Montreal Mayor Valérie Plante wished Labeaume courage on Twitter, saying he has the support of her administration. Former Montreal mayor Denis Coderre also shared his support on Twitter, saying Labeaume's will is stronger than the disease. Mon cher Regis je suis de tout cœur avec toi. Je sais que tu es un battant et que tu vas passer au travers. La volonté est plus forte que la maladie. Pour avoir vécu une prostatite aigue je sais dans quel état d’esprit tu peux être. Lache-Pas. Tu peux compter sur moi mon frère. "You can count on me, my brother," Coderre wrote. Labeaume was first elected as mayor of Quebec City in 2007.